I use Photoshop and Photoshop Elements pretty much daily. But I often can’t remember the exact steps to complete a certain edit or effect that I want to create. I don’t do it enough. I either have to go to my notes, a magazine article, or perhaps a previous blog post to fill in the blanks to fill in the blanks of my memory. What I have been doing for awhile now is to prepare a cheat sheet that lays out the basic steps concisely. I think that these cheat sheets may come in handy for others as well. That is where the AppTip Sheets come in. They are kept as short as possible, and assume the reader knows how to use the subject program. They just need a little help in putting steps together. Another possible scenario is to provide a top level view of the various screens for a new app on a smartphone or tablet. These cheat sheets help me a lot. Maybe they will you, as well. So, in this post, I have included an AppTip Sheet for removing a colorcast in a photo. The screens are for Photoshop Elements 2018, but older versions of Elements work equally as well. Let me know what you think of this type of format. I plan to post others shortly. If you have an idea for a certain topic or program, let me know that as well. For the past year, I have been posting a series of Photoshop Elements tutorials, covering both the Organizer and Photo Editor modes. The series started using PSE 15. When PSE 2018 was released I switched to this new version. However, those that were written using PSE 15 screen shots as the figures are virtually the same for PSE 2018, the latest version of Elements. For those of you who are new followers of my blog, links to the tutorial posts are shown below. I started with the Organizer, and then moved on to the Photo Editing tutorials. A list of the links to the tutorials is shown below. As you can see, the title is embedded in the link, so you can quickly find a topic you may be interested in. These tutorials are based on updated handouts that were part of my Photoshop Elements classes I taught. Some of the tutorials are videos. They all are PDF files that can be downloaded and printed. I will be continuing the series shortly usig PSE 2018. I hope you find these useful. Adobe has released their latest version of Photoshop Elements. They have changed the official name to Photoshop Elements 2018. Previously this version would have been named Photoshop Elements 16, since the latest commercial version in stores is Photoshop Elements 15. CLICK HERE to view their announcement. Announcing the next version of Elements in Fall has become a ritual with Adobe. I have been using the beta version for the past several months, and PSE 2018 has several new features that I am sure will be popular with new and old users alike. In the coming weeks and months, I will be posting tutorials on several of the new features, but for now, here is quick rundown. If you are familiar with earlier versions, you know that PSE 2018 includes both the Organizer and the Photo Editor modules. In my PREVIOUS POST, I did a quick overview of what is new in the Organizer. 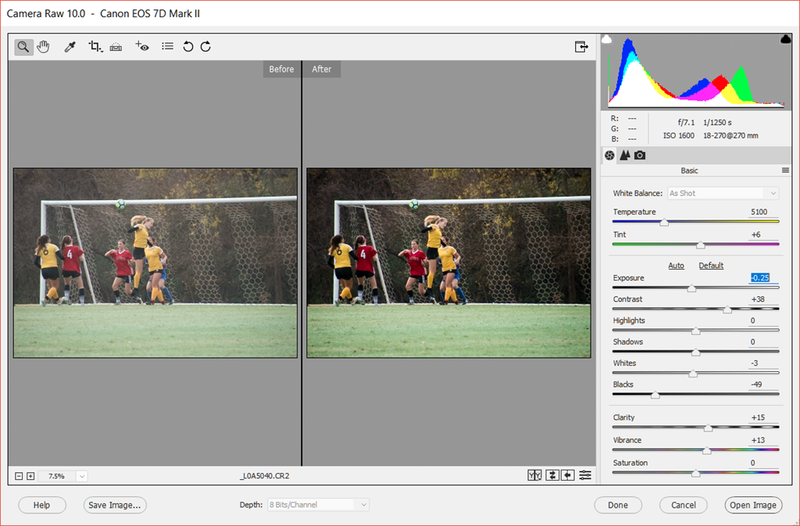 In this article I will do the same for the PSE 2018 Photo Editor module. As you can see from the figure below, the Photo Editor workspace has remained the same. For those of you who are using PSE 11 or later versions, you will find yourself right at home. As is generally the case with these annual updates, PSE 2018 is an incremental upgrade to PSE 15. Most of the work in the Photo Editor has been adding new Guided Edits. A couple of new and exciting tools have also been added. The new tools are the Automatic Selection Tool, and the Open Closed Eyes Tool. The new Guided Edits include Water Color, Double Exposure, Shape Overlay, and Background Changer. This tool is has been added to the other selection tools previously a part of the Photo Editor. It can be accessed from both the Quick and Expert editing workspaces. Basically, how you use it is to draw a rectangle or oval around the object you want to select. Once you let go of the mouse, PSE 2018 makes the selection. Depending upon the background, the initial selection will need some fine tuning, which you can do with the other Selection Tools available. In the example below, there is a somewhat complicated background, so the selection is going need fine tuning. For more solid backgrounds, the new Auto Selection Tool can get quite close to the final selection. We have all been in a position where we are taking a group photo and we have a great photo, except one person has their eyes shut. That is where the new tool, Open Closed Eyes comes in. The figures below outline the process. The tool is quite flexible as to where you obtain the source photo. PSE 2018 Photo Editor includes four new Guided Edits. Guided Edits essentially lead you step-by-step through the process of creating the final effect. Some of the Guided Edits are relatively simple and others can be several steps. Pretty much all of them can be further tweaked from within the Expert mode of the Photo Editor. The Watercolor effect is found in the Special Edits group of the Guided workspace. It’s an example of a multi-step Guided Edit.. This effect is found in the Fun group of the Guided Edits workspace. Again, this edit includes several steps to guide you through the process. Given the right picture and your creativity, very interesting photo interpretations are possible. As you can see from the figure below, my creativity needs some (ok, a lot of) improvement. Again, this Guided Edit includes several steps giving you plenty of opportunity to personalize your final photo. The figure below displays just how many layers and operations are employed. It also illustrates how the Expert Edit mode is available to further edit the photo to reach the desired result. The Shape Overlay is another Fun Edit within the Guided Edit workspace. The figure below shows the various things you can do with the result of the Shape Overlay Guided Edit. In fact, this screen is typical for other Guided Edits, including sharing the resulting photo. The final new Guided Edit introduced in PSE 2018 is the Replace Background. This one is found in the Special Edits group. Notice in the figure below, in addition to selecting a preset, as I did here, you can also select one of your own photos for the background. This particular Guided Edit is one that you may use quite often, in contrast to others in the Guided Edit workspace that you may use only infrequently. Well there you have it. This new version of PSE 2018, although an incremental upgrade, probably has something for everyone. Over the coming weeks and months, I will be posting tutorials, both written and videos, on the new PSE 2018, as well as Premiere Elements 2018 (PRE 2018). Stay tuned.